Ham radio operators are saving Puerto Rico one transmission at a time « Adafruit Industries – Makers, hackers, artists, designers and engineers! The phone call from the Red Cross came in late Friday night, just as the full scale of Hurricane Maria’s calamity began taking shape. In the days after the worst storm in three generations hit the American island — and for many more to come — public electrical, land-line and cellular communication systems showed few signs of life. And radio networks used routinely by police officers, power company workers and other first responder still were down. Yet, a key mode of communication — one not reliant on infrastructure vulnerable to strong winds and flooding — still crackled: the “ham” radio. Answering the phone that night in Connecticut was the emergency manager for the American Radio Relay League, the group’s CEO said. For more than a century, this group has served as a hub for amateurs licensed to operate the dependable, if archaic, medium known as ham radio and eager to pitch in when disaster strikes. When the Red Cross made its latest appeal for heroes, these were the people it had in mind. Already gearing up on his own that night to go to work, turning knobs and flipping switches, was Oscar Resto. 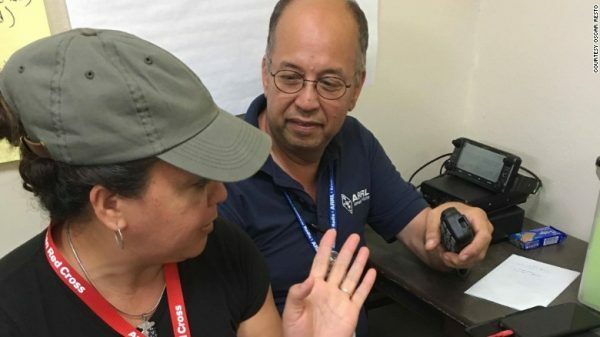 As one of dozens of ham — shorthand for “amateur” — operators across Puerto Rico, Resto had been authorized by the Federal Communications Commission to use radios, computers, satellites or the Internet to assist and support public safety during emergencies. For three days after Maria hit, Resto sawed through the downed trees that separated his home from the road, he told CNN. Then he packed his car with radio gear, left his family and made the 25-mile journey to a makeshift Red Cross headquarters, where generators and batteries could power his equipment. “I have the responsibility to establish the required emergency communications that the American Red Cross needed for understanding the needs of the citizens impacted by the hurricane,” said Resto, a section manager for the American Radio Relay League, which boasts 160,000 members. Survivors needed food, water, shelter and fuel to power generators after Maria knocked out the entire electrical grid. They also needed to communicate, to share critical information about diabetics nearing the end of their insulin reserves, babies threatened by dehydration, families rationing crackers. Transmitting radio signals to other ham operators in the Caribbean, Resto and his shortwave brethren traded National Hurricane Center reports on Maria’s position. He also contacted a ham operator in Florida, and asked “just to tell my daughter, Astrid, that we were fine,” he recalled. Before long, Resto and his compatriots realized their messages were the only ones getting off the island. In an instant, their mission expanded: Anyone with the requisite skills and equipment was conscripted.